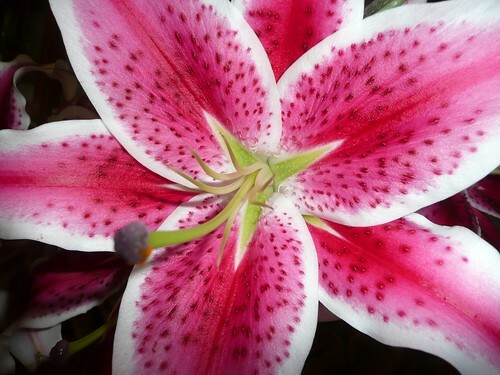 I love Stargazers. They are so beautiful and fragrant. I put up a short post about them once in 2009. There is a picture. It seems that the most recent ones we have gotten have not been as pink. They are very pale. And they do not have that strong intoxicating fragrance. We used to have them all the time in the house. Then I heard that they were toxic to cats, so we stopped buying them. We had some recently . . . I do love them. I was looking at the information on Wiki hoping to share more information than in my first post. There was not a lot of information. The most interesting fact was that they were created in California in 1974. A lily breeder created them. Wow. What a cool thing to have done. Created one of the most popular flowers. If you Google her name a lot of lilies show up. So I am thinking that some are named Leslie Woodriff. The pictures I saw were of “drooping” lillies. I have not seen stargazer droop like that. Click here to see what I mean. Kidney failure occurs as early as 36 – 72 hours after ingestion. 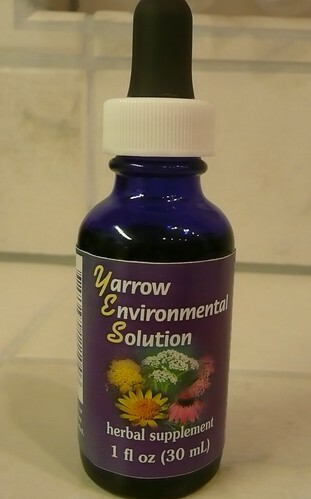 The article states in addition that treatment is aggressive and can be successful if administered within the first 18 hours. Wow. Our cat was not one to climb up on things all the time. Yeah, she did it, but not all the time. She didn’t get into a lot of things. But once we learned they were poisonous to cat’s we didn’t buy them any more. Also, if you have ever had these types of lilies you might have experienced staining from the anther, the orange pill shaped thing that is on the end of the stamen and is powdery to the touch. I had thought these lilies were older than 1974 and was convinced that ancient civilizations used them to dye things. That stuff stains no matter what it touches. Just a little powder from one of those things can make a huge stain. 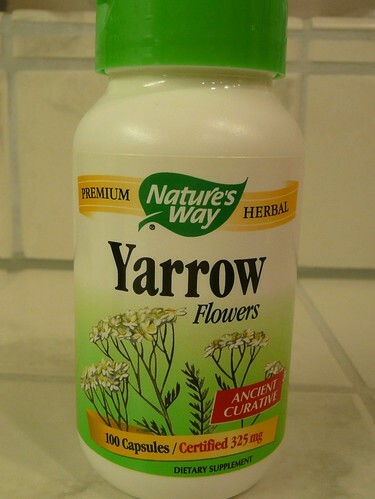 My husband and I are very diligent in pulling them off and throwing away before they can dust the surface below the vase with any powder or worse yet, fall onto the surface. If powder does happen to get onto something VACUUM it up or use a DRY cloth. If any amount of moisture touches that powder it has even MORE staining power. Any of you know what I am talking about when it comes to those things? Incredible. So do you like these flowers? Do you love the smell? What type of flower do you like? Sometimes I just can’t think of anything to write about. Sometimes it could be that I want or need a break. So today — I am just going to post some pictures. 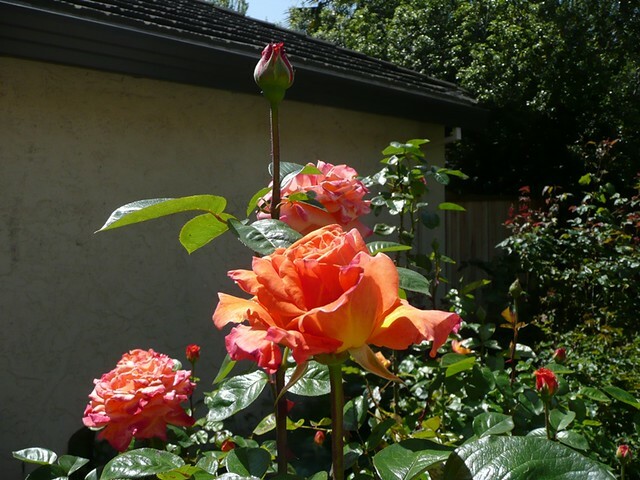 We have been having really beautiful weather in the San Francisco South Bay Area and beyond. I love it, but I wish we would have rain because we need it. But . . . it is Spring now . . . so I will enjoy it. 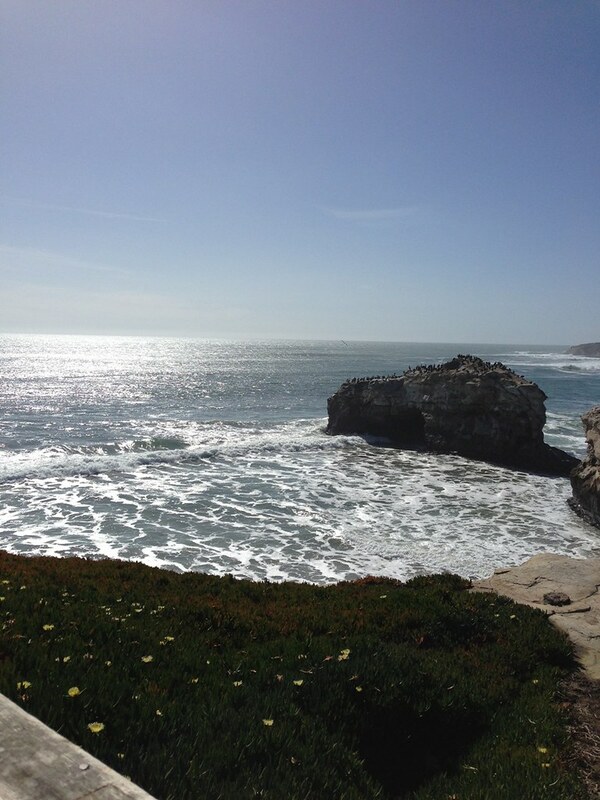 The first few pictures are from a trip to Natural Bridges — a state park in the Santa Cruz area of California. 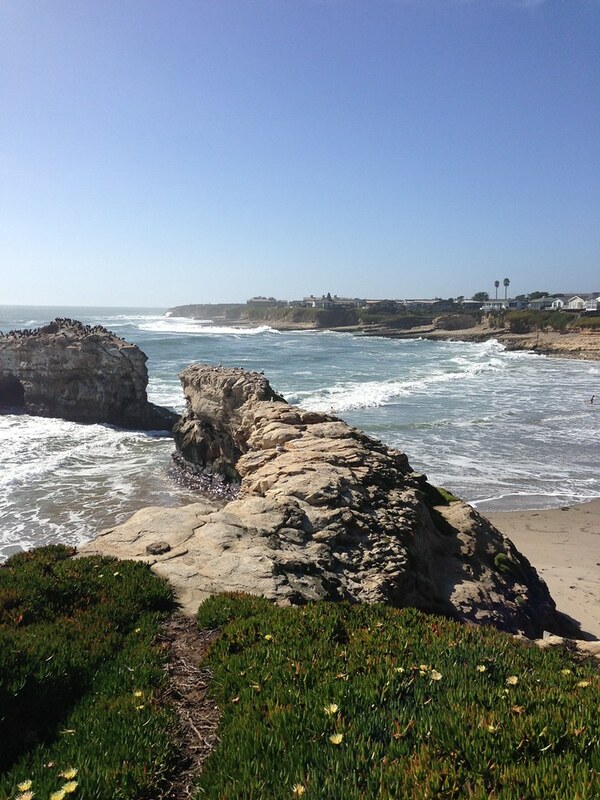 Whenever we go to Santa Cruz for a Nia class we like to stop by the ocean. Santa Cruz is not that far from San Jose, but I just don’t get over there often. When I make the drive over I like to at least set my eyes on the ocean. I remembered my phone has panorama. The bridge that was natural actually collapsed a while ago, but it is still a very pretty spot. Then, the next week, I was “over the hill” again. I was visiting a friend who is moving. She wanted to get the kids out of the house on such a gorgeous day. 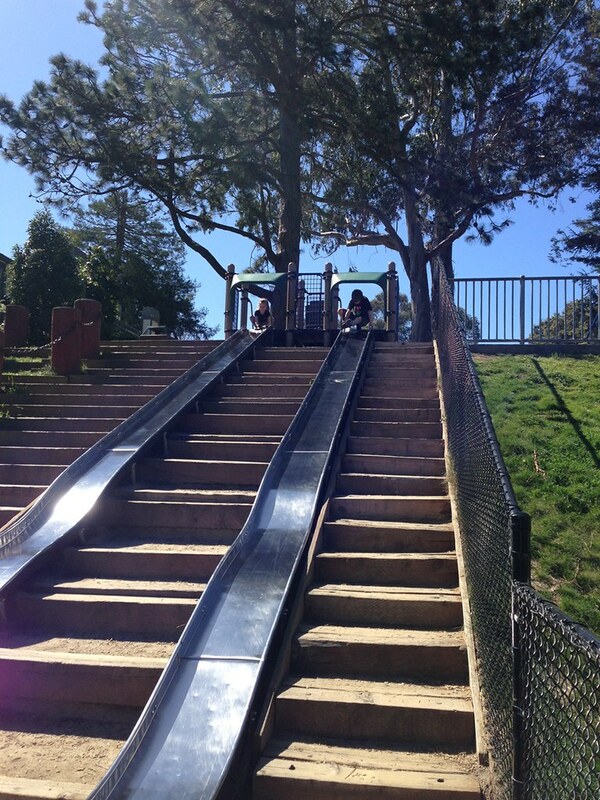 This is a slide at one of the parks. WOW! And, of course, I take a million pictures of my cat, so I thought I would share. 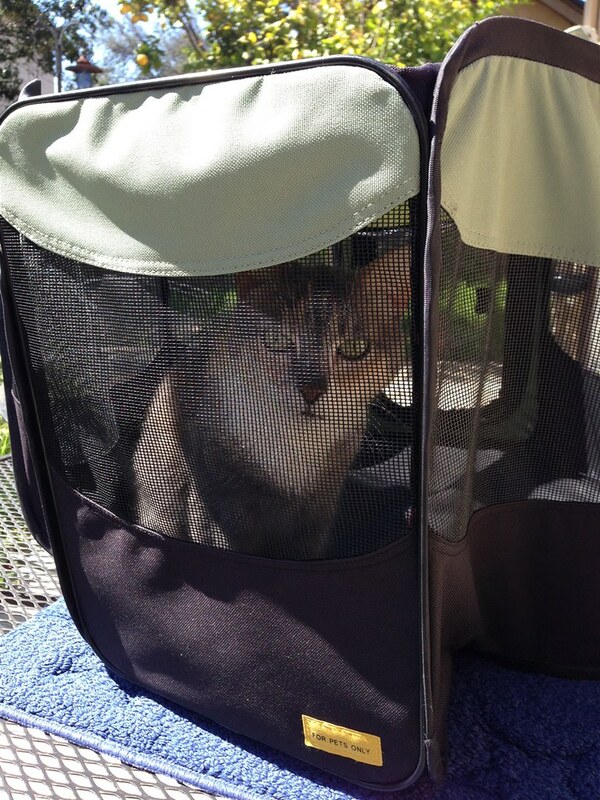 She likes to be in her outside house but with the door open. She loves the sun, but doesn’t like to get too hot. 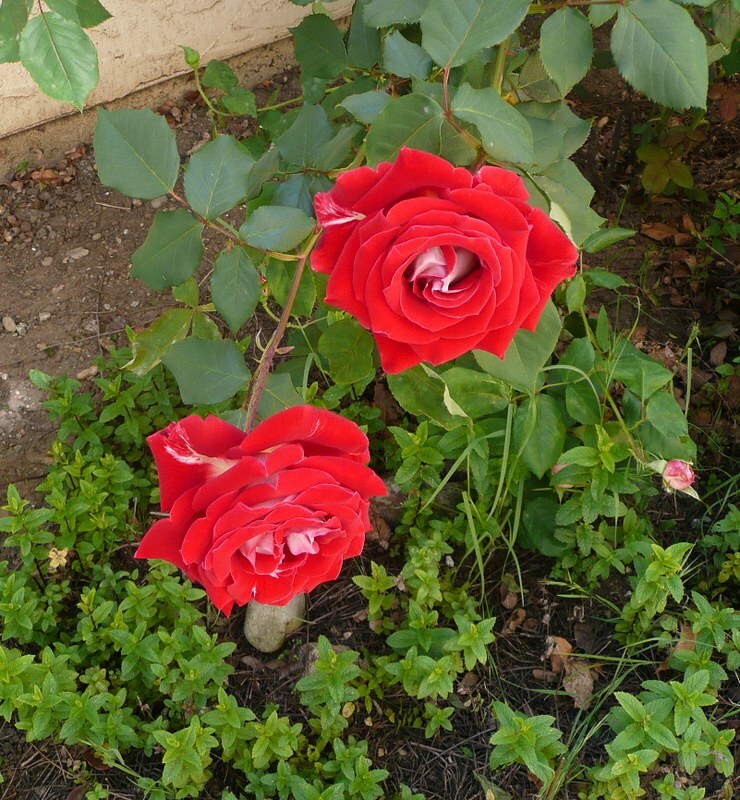 Then there are our roses. They are in bloom. They are beautiful. And, yes, they smell fantastic. I like to bring the beauty inside. They make the house smell great! Thanks for taking this little Spring Break with me! Are you enjoying the season? To me life is about learning. I have learned a few things since I started my Nia Class on Monday in Campbell in the evenings and my Nia Class on Saturday. It is much better for me to have Monday’s dinner cooked on Sunday. So I have been planning my weekend meals so that I have leftovers on Monday. You may have noticed that I didn’t post anything last Saturday . . . . lesson learned: I need to make sure my Saturday post is done on Friday. I have too many other things to do when I get home from my 10:00 am Nia Class. It ends at 11:00 so I don’t get home until 11:30 (at the earliest) or noon! So I really need to have my post done because the next thing I know it is 1:48 am on Sunday morning and I am just noticing I forgot to post on my blog. 😦 Well, it was only the second time I forgot. The first time also was a Saturday. This past week the weather has been gorgeous here in San Jose. I haven’t spent much time lately getting any pictures of our yard happenings. This past week while the weather was cool and nice I took a few. I thought I would share some with you. It has been awhile since I have shared some fun pictures on my blog. This guy has an injured foot. I noticed his injury about the same time I hurt my foot. 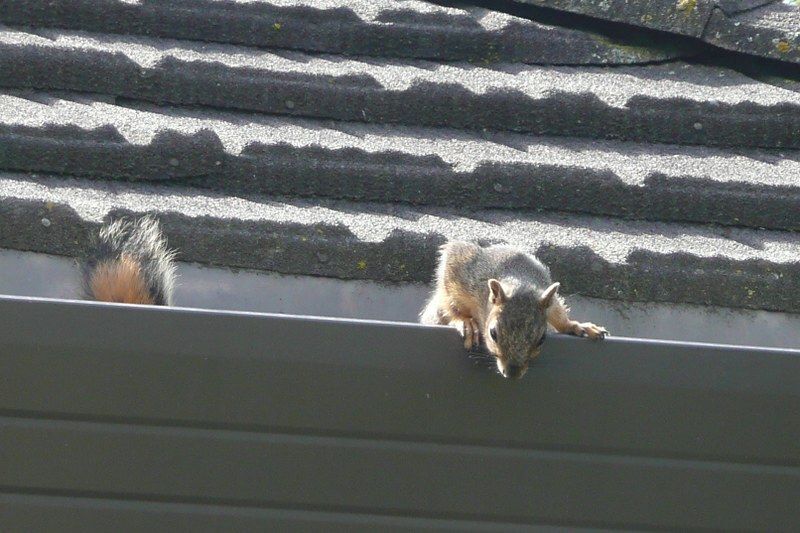 I try to keep an eye on him and make sure he gets some nuts. And he makes sure I know he wants nuts. He will find a spot where he can look in a window at me and stare. He will stare at me until I go outside and give him some peanuts. He is doing that now. Staring. 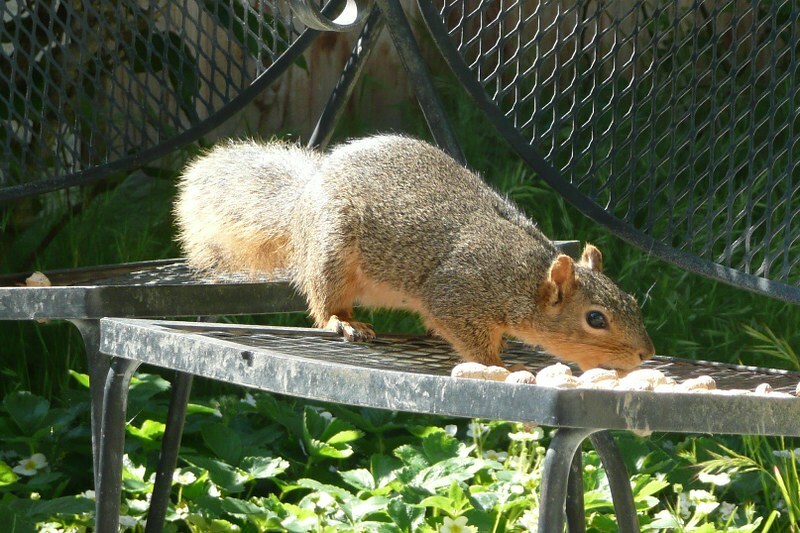 Of course, I went outside and gave him some nuts. Did you notice how clear the sky is? 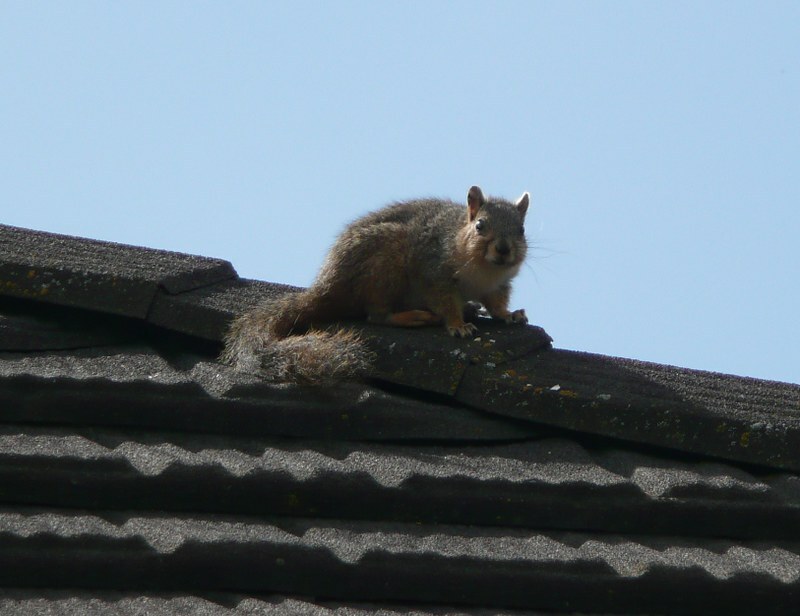 Sometimes the squirrels drop whatever it is once they get it up to the roof. 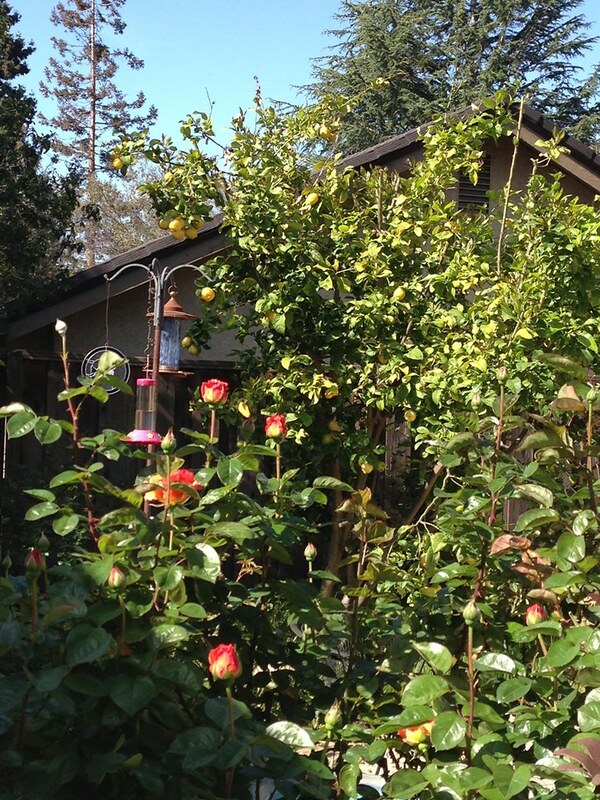 There is often fruit in our yard that doesn’t blog to any tree we have. 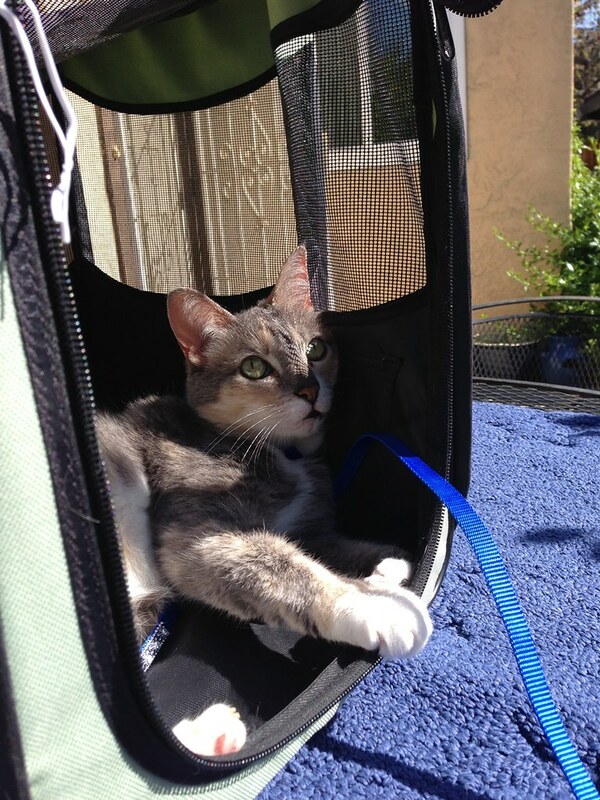 Here is a picture of the cat enjoying the sun. She will stay in the sun for a bit, then get too hot and move. 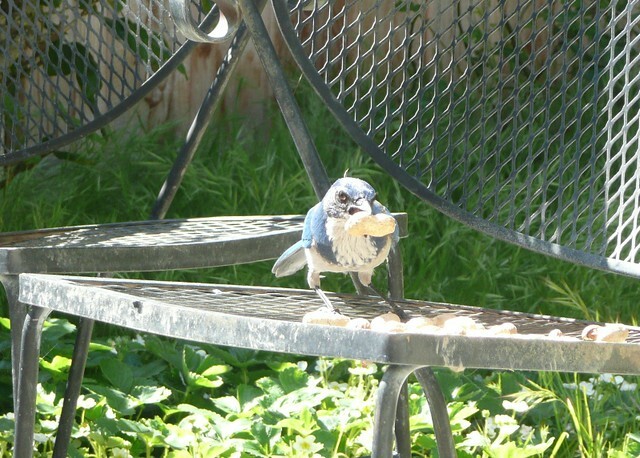 The blue jay was getting some nuts. I took a few shots “through” the chair then I went out and turned it so I could get a clear shot. And of course I sat there for a long time waiting. 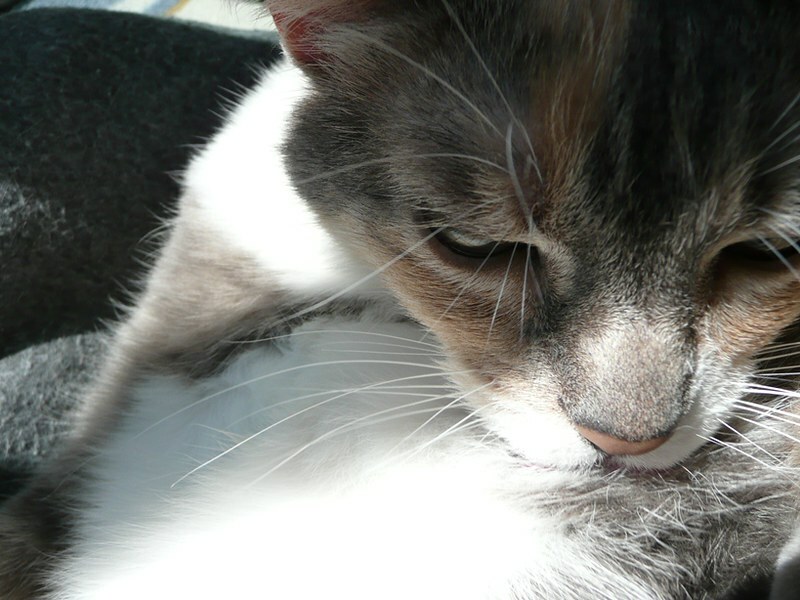 I got bored with staring at my camera at a peanut filled chair so I started taking pictures of the cat. What happens? 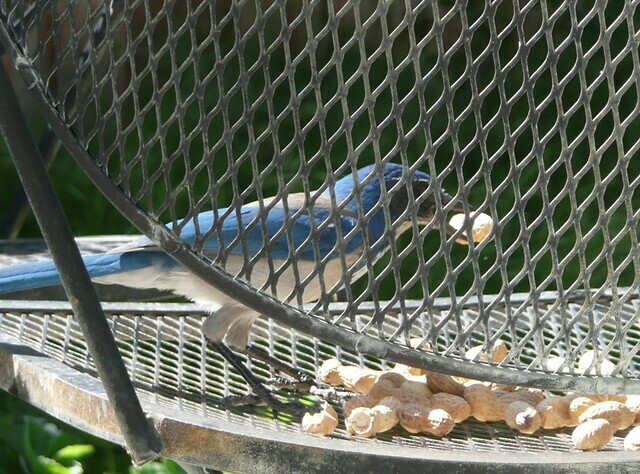 The blue jay sneaks back while I wasn’t paying attention. But I managed to get a few. Of course the squirrels wanted some too! I wanted to get some shots of our blooming rose bush. A while back I was unhappy with the wilderness that was out the window so I went outside and did some pruning. It was completely “Edward Scissorhands” style as I just took the saw and went right and left and left and right and up and down and down and up and all around. I just wanted all the wildness gone. So I was very concerned that I wrecked the bush. 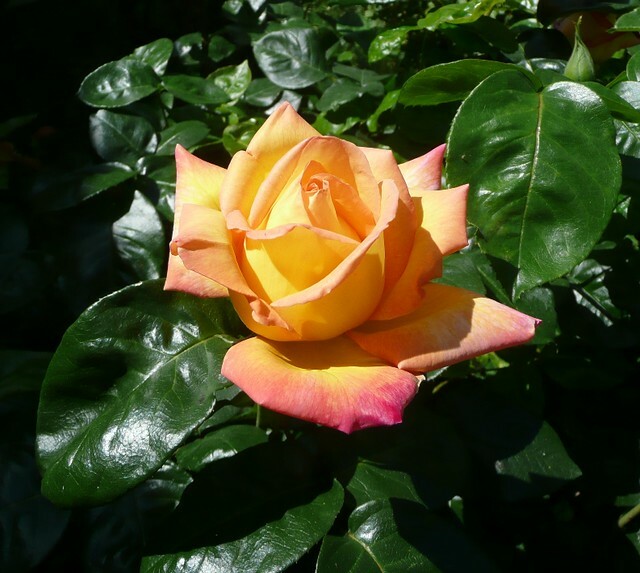 So when I saw one rose I was very happy. And now that the whole bush is blooming I am really happy and wanting to share. I’ve posted about how weird our roses are. But I still like them, even though they start out really sunset orange and then fade to a washed out peach. They SMELL really good. One bush has a single flower on it. The single flower is pictured below. Well, thank you for stopping by and visiting our yard. We enjoy the entertainment the wildlife offers and the beauty that the flowers share with us. I hope you did too. Do you have a flower garden? Do you have a vegetable garden? Fruit trees? 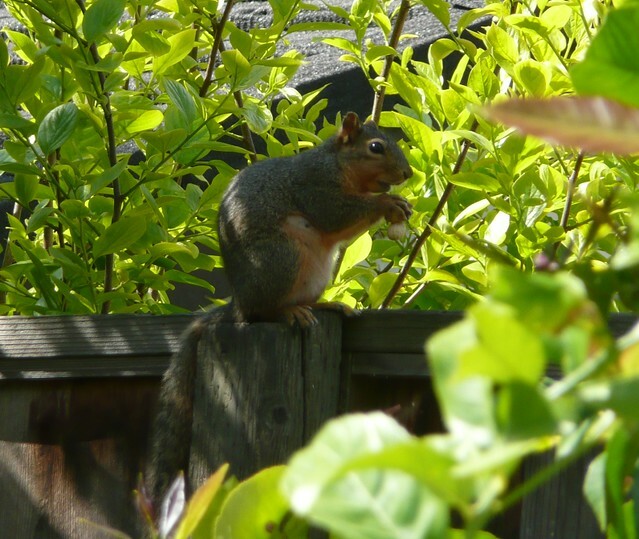 Does any wildlife visit your yard? I have learned a lot from our backyard here in San Jose. One thing I have learned is even rose bushes change. 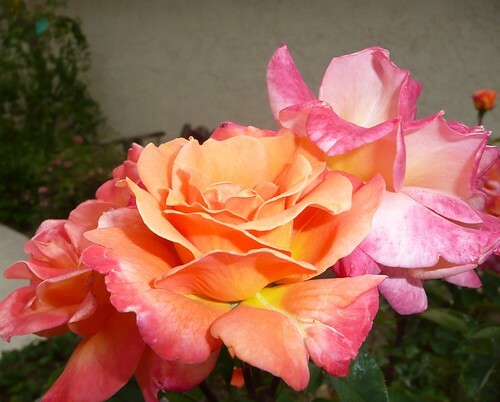 I am posting pictures of our roses because they have changed over the years. When we first moved in there were ORANGE. 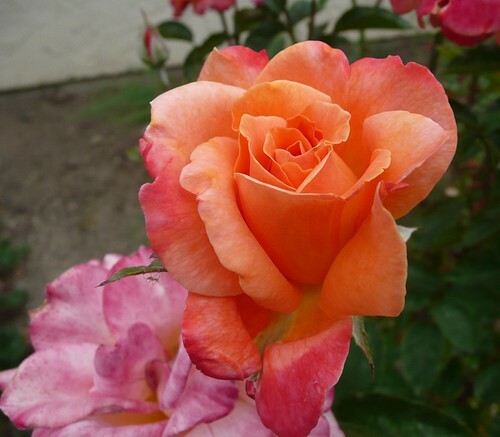 I had never seen roses so orange. 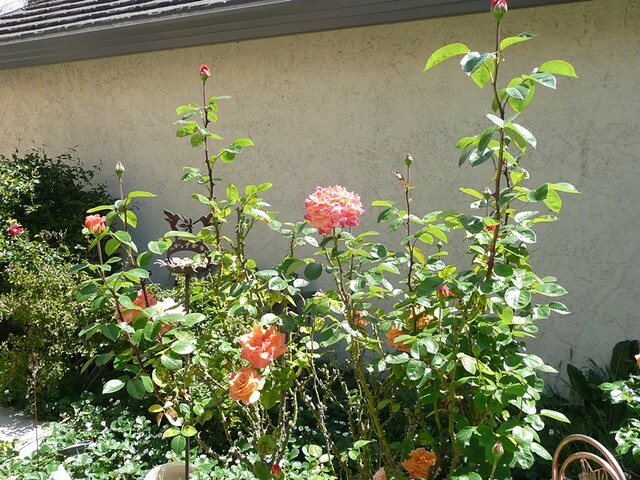 My husband wanted to rip out all the rose bushes and rearrange the yard and I requested that he keep the orange rose bush. I didn’t care about anything else in the yard but that one bush. 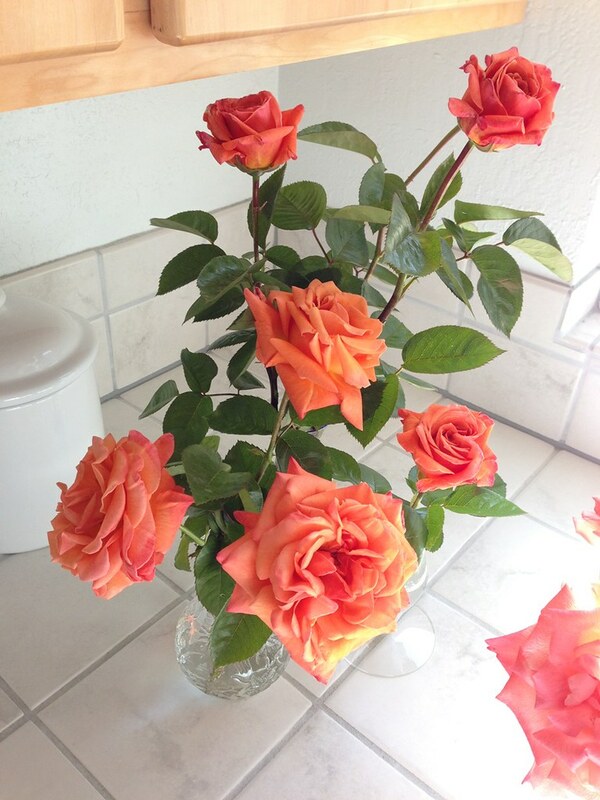 I was fascinated by the orange roses. And so were many people that saw them. 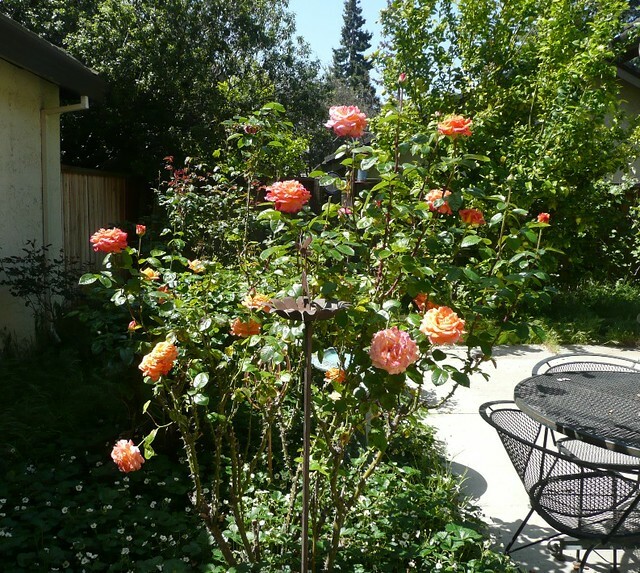 When we first moved in we had a ton of roses, all the time, or it seemed like all the time. We would have flowers in the house all the time. I would also take them to work. People would stop and ask me about the orange roses. That is how vibrant their color was. 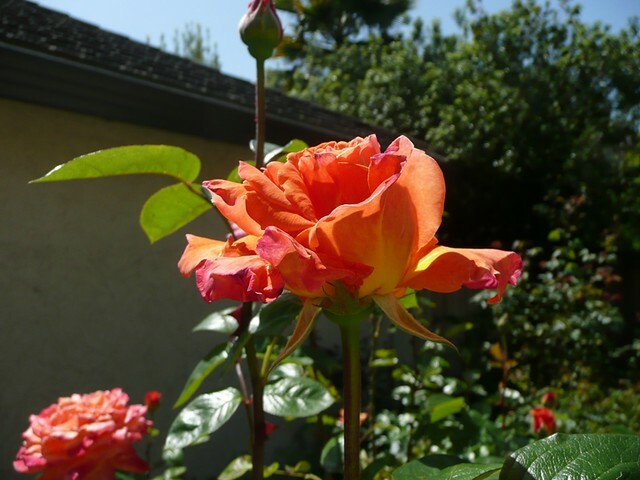 While I am not sure about how my hubby felt about the orange roses, I know how he felt about the rose bush. He HATED it. It was one of those bushes that had thorns everywhere. At the top of the stem near the flower there would be hundreds of little tiny thorns. When they got in your fingers, they felt like fiber glass. The thorns were progressively larger as they went down the stem. There was never any room on the stem to put your fingers. So working with these roses always resulted in bloody fingers. The thorns at the bottom where huge, sometimes as big as a half of an inch. Also the blooms had “less petals”. 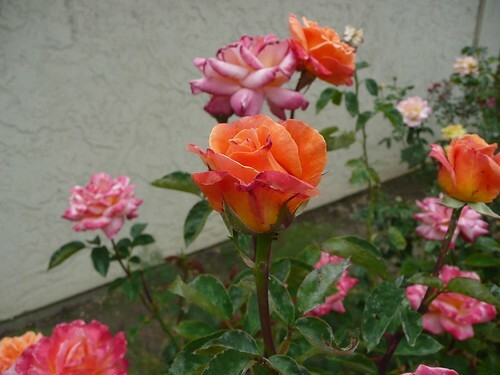 I think of the “less petal” roses as “real” roses. 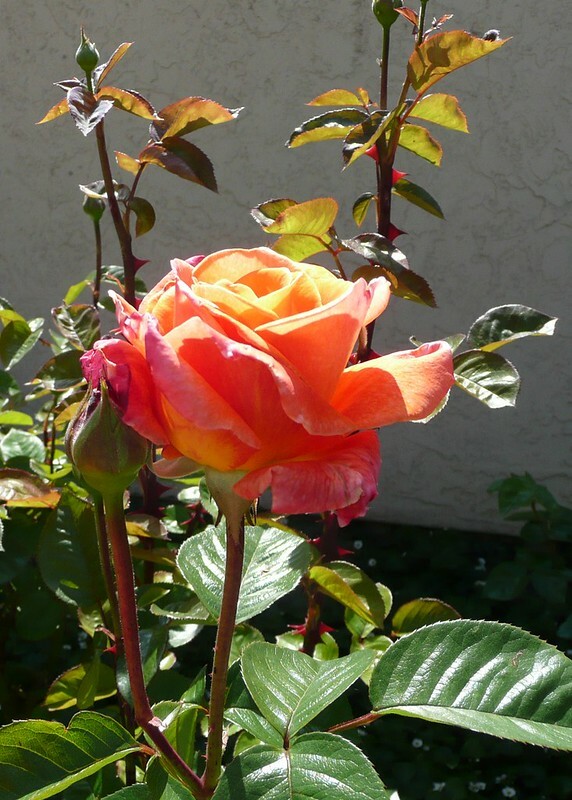 Early this week, while I was practicing Nia, I looked out the window and saw a huge rose on the bush. I decided I wanted to have it inside. So I went out to cut it. 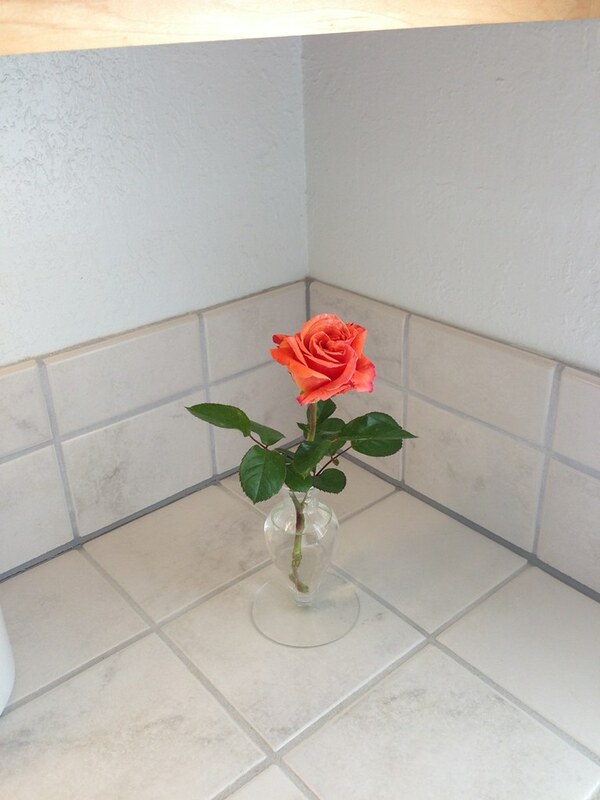 Even though the rose was next to a bud, I decided to cut them both so the stem would be long enough to put in a tall vase. I also cut another rose. I was holding them while I was looking for a vase to put them in, it occurred to me that there was one (ONE!!!) 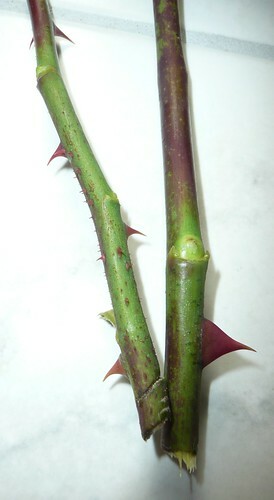 thorn on the big rose’s stem. And the other one hardly had any. 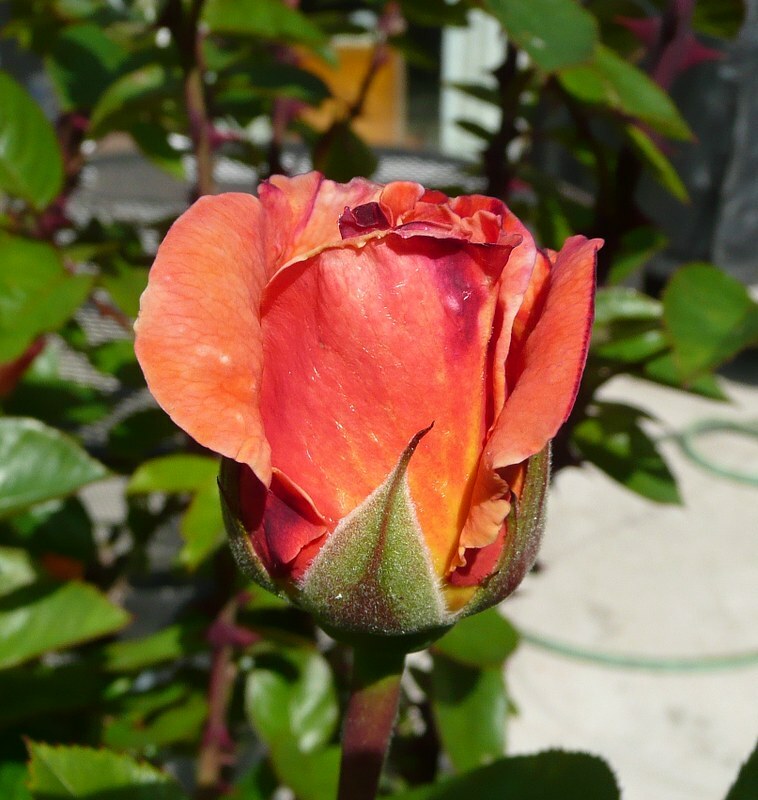 Then I looked at the rose itself and noticed it too is different. 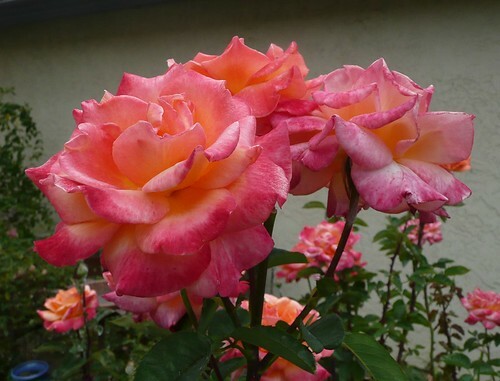 I had previously posted about the color change of our roses, but I had not noticed the lack of thorns nor the increase in the amount of petals before. 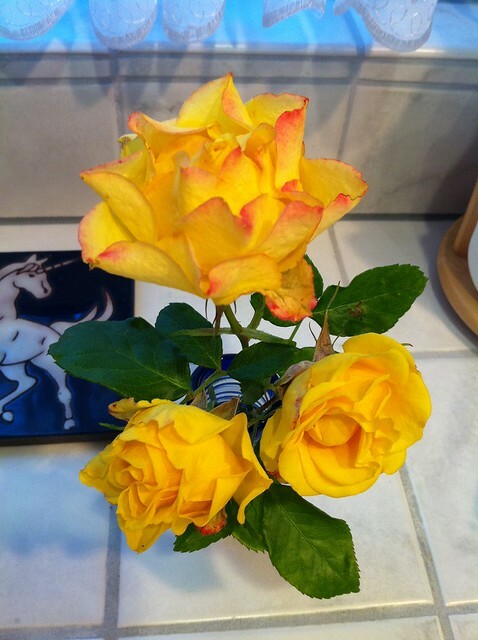 They are still very beautiful and I love having roses in the yard and in the house. 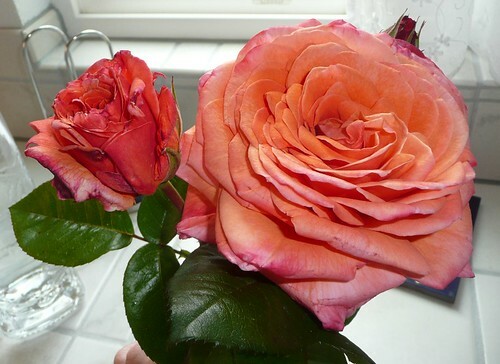 But, there are not the same roses that we had when we moved in. So I learned that roses morph. 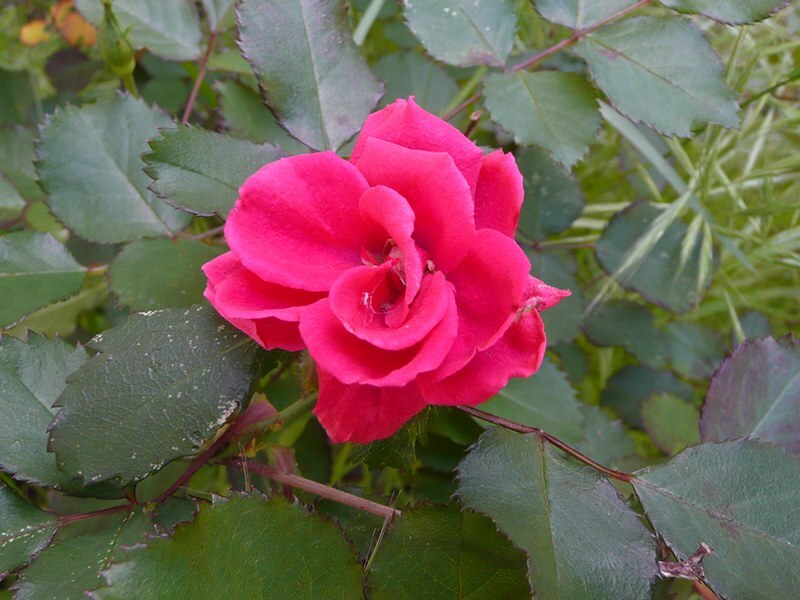 The rose bush that has been in our yard since we moved in eleven years ago has changed. Interesting. I guess most things change huh? I had noticed that the flowers were not longer the striking orange color they had used to be, but I just noticed the flower itself is different and there are less thorns. They have been changing over the years. Do you know why? Is it cross pollination? Do all roses do that? 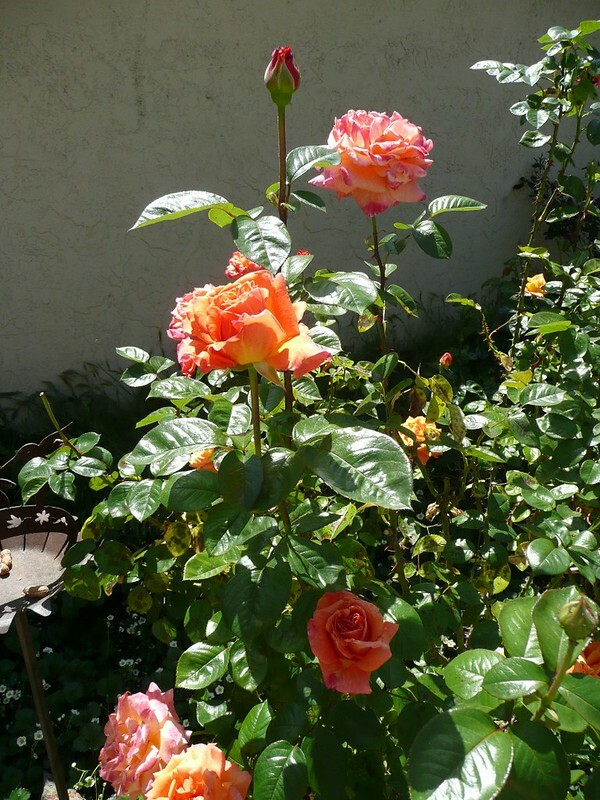 It is funny to me because when we first moved to San Jose, this rose bush had JUST orange roses. Bright orange. Now some come in pink. The ones that do come in orange turn pink. 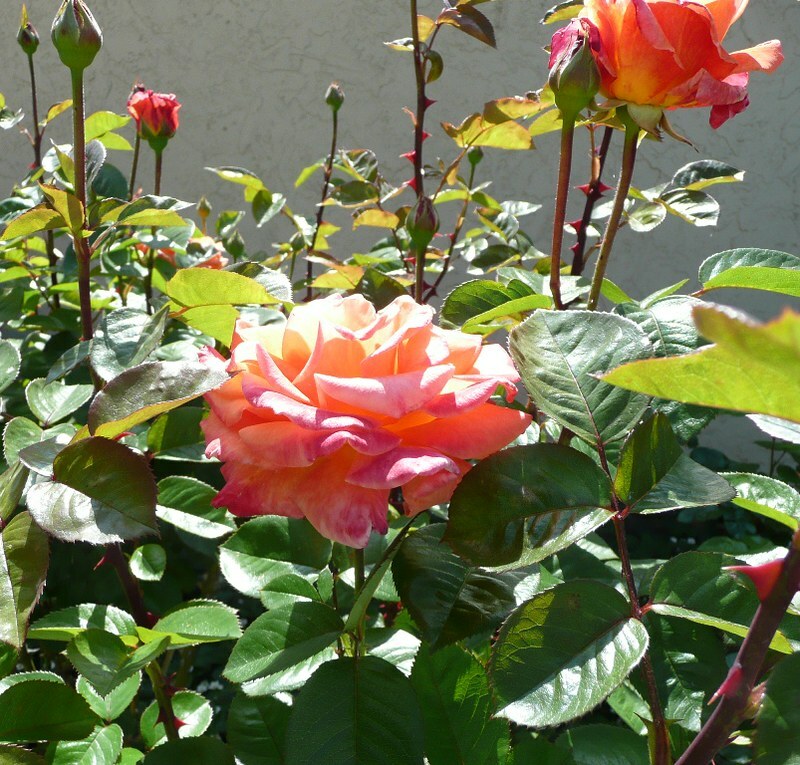 All of our rose bushes are multi-colored now. Funny how it worked out that way. I still think they are awesome. I wish you would smell them. My blogging intent was to blog about healthful things, exercises, nutrition, but I keep thinking that readers might like other things too. And I keep thinking of things I want to share. I have so much I keep learning about Nia, we are doing more things in San Jose, and life is just full of stuff. I am going to try to start posting three times a week instead of two. I think that I am going to keep up with my opinion on healthful things on Tuesdays and Saturdays, but on Thursdays my posts will be different. We will see how this all goes. With my first post that is less-in-the-realm-of-wellness-and-the-like will be simple. I wanted to share, that my house smells like flowers. 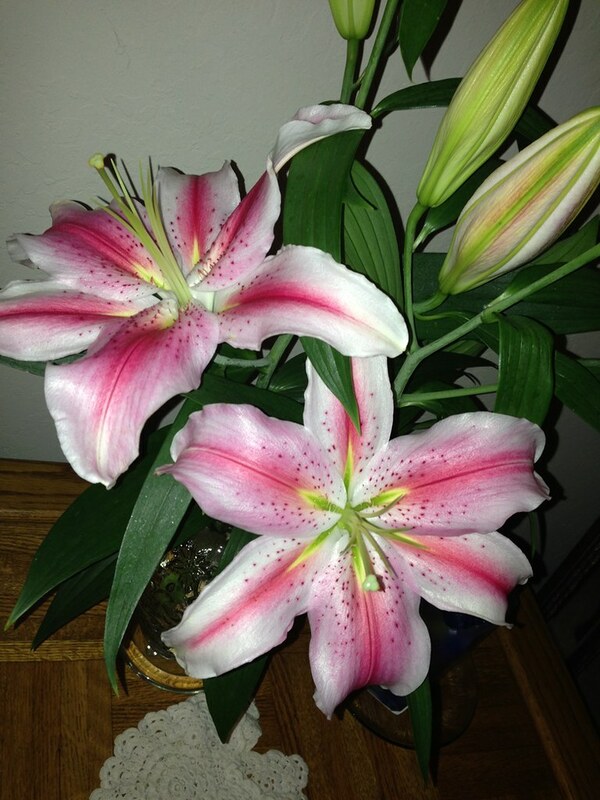 I love Star Gazers** and recently (almost two weeks ago), my husband bought me some. He bought roses and Star Gazers, but the Star Gazers have lasted longer. And they make our living room and dining room smell so nice. You cannot walk down the stairs or sit on the couch without getting a big whiff. They are so gorgeous. What is your favorite flower?